If you’re planning your next vacation, come on a journey with us through a day in the life at Serenity Resort, perhaps one day you’ll get to experience this paradise for yourself! For those of you who have never visited this beautiful island before, we’ve got the insider scoop on how to make the best out of your first visit to Phuket, so you can enjoy it to the fullest. The Phuket news is that East 88 is back!!! The East 88 Restaurant and Beach Lounge situated on the water front within Serenity Resort and Residences is officially re-launched with a new menu, the same excellent staff and service, along with a new restaurant website, Facebook Page and associated social media outlets. The NEW and EXCITING food menu at Two Chefs Beach Bar & Restaurant at Serenity Resort & Residences Phuket has just been launched! 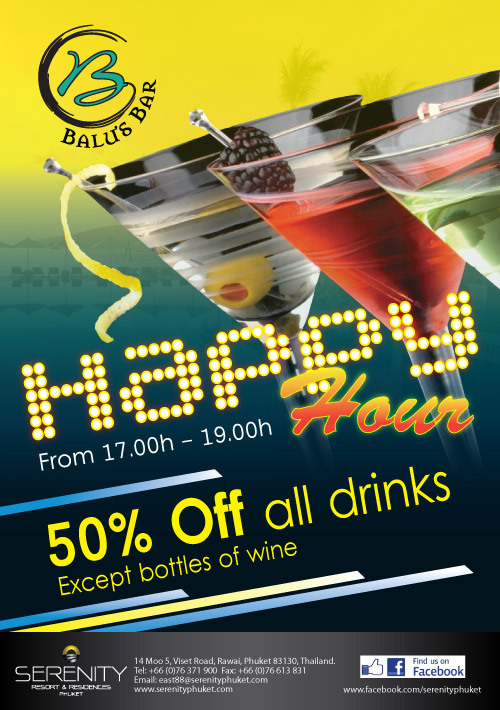 Kick back and enjoy a cold drink at Balu’s Bar for Happy Hour, with 50% off drinks from 17:00h and 19:00h every day! Enjoy the majestic views and specialty drinks and cocktails, while chilling out at Phuket’s Coolest Beach lounge. Top 10 Bars and Night Clubs in Phuket! Now that your ‘In-the-know’ about the Top local restaurants, its only fair that we dish the dirt on the best bars and nightclubs in the area. First of all you should know that Phuket is home to an eclectic mix of Bars and night clubs, ranging from the chilled-out nightspots, through to the downright bizarre…here, we will focus more on the former. Once again, our in-house connoisseursÂ (Urs & Pascal) were consulted for their recommendations, so here they are, our local Top 10 bars and nightclubs in Phuket. What list of great bars in Phuket would be complete without Balu’s bar i hear you say. Balu’s bar offers friendly staff, a cool relaxing setting beside the sea and a range of unique cocktails, excellent wines and International drinks of all kinds. Chalong’s newest nightspot is the O2 beach club, a chilled-out beach club / night club, with a kids corner in the day time and lively music in the evenings. Popular with tourists, the O2 beach club is one of the larger beach / night clubs in Phuket’s south. The V lounge in the Da Vinci Restaurant, is an upmarket lounge bar with comfortable sofa seats and a large range of wines and cocktails. 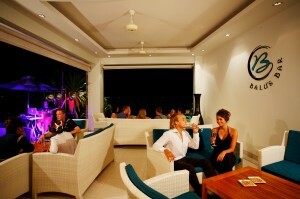 Offering a chilled out environment, the V lounge is popular for after-dinner drinks. The Timber hut in Phuket Town, has been one of the most popular night spots in Phuket for almost 27 years, popular with tourists and locals alike. Timber Hut has a live in-house band who perform a mix of Thai and International Pop songs. Sofa Pub in Phuket town, is a modern style nightclub complex, often featuring live bands and even livlier DJs. Sofa is a late night night club popular with tourists and locals in Phuket’s town centre. Sanaeha is a hip young bar in Phuket town centre, known as ‘old town’, with live music a few nights a week. Ideal for a date or a night out for a small group of friends, Sanaeha, offers an intimate and vibrant setting and a range of wines, beers and spirits. The factory bar in Patong is perhaps the most lively of our Top 10, set in the heart of Patong. The factory bar is a lively night club/bar with chilled-out sofa seats, popular with the younger tourist crowd. Freedom bar in Rawai, is a lively local hang-out and a sports bar. Showing all the major sporting events, Freedom is popular among the younger visitors to Rawai. The brand new Oranges Irish Pub in Nai Harn village, is the newest edition to the Nai Harn Bar scene, offering all the traditional Irish and international beverages. Friendship Beach, Serenity’s neighbour, offers a chilled-out setting beside the sea, ideal for after dinner drinks, with it’s romantic setting and large range of drinks and cocktails. Do you agree? Do you think there are other some better local bars to visit in Phuket? Think others would agree? Let us know your thoughts at blog@serenityphuket.com. The Top 10 Local Restaurants in Phuket! One of the most common questions we get asked by our guests, is which local restaurants we recommend. One thing that Phuket has a lot of is restaurants, with a huge selection, from Fast food all the way through to International standard fine dining. Perhaps we are being a little bias here, but no visit to Phuket’s sunny shores would be complete without a visit to East 88. East 88 offers a wide selection of International and Thai dishes, including fresh seafood and new takes on classic dishes. M&M’s Pizza is a bustling restaurant in the heart of Nai Harn Village, serving traditional Italian Cusine, with a wide selection of freshly made pizza’s, pasta’s and Italian delicacies. Those with a taste for seafood, should not miss a visit to Palai, a few kilometers north of Serenity, with a stunning range of the freshest seafood, offering fabulous value for money. Da Vinci Restaurant, is an upmarket International Italian fine dining eaterie, in the center of Nai Harn Village, not far from Serenity, with a selection of fine wines, pizza’s, pasta’s and meats. Enjoy the marvellous view overlooking chalong bay and a wide selection of fresh seafood and Thai dishes, at the popular Kan Eang @ Pier Restaurant, 1 kilometer north of Serenity. The Saigon Restaurant in Rawai, provides an excellent selection of traditional and authentic Vietnamese food. 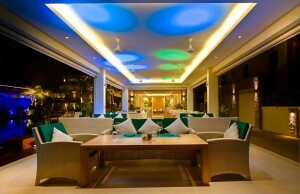 The Wine Lovers Restaurant in Rawai, offers Thai Fusion and International cuisine including a wide selection of wines. Nikitas in Rawai, popular is foreign visitors, offers a wide selection of Thai and International favourites, located beside the sea on Rawai Beach. Rawai Fresh Seafood Market, a favourite of the locals, is your spot for some of the freshest seafood around, offering great value for money. Enjoy a slice of Traditional Thai food and unusual surroundings at the Tamachart Restaurant in Phuket Town, with a large selection of meat and seafood dishes. Do you agree? Do you think there are other some better local restaurants to visit in Phuket? Think others would agree? 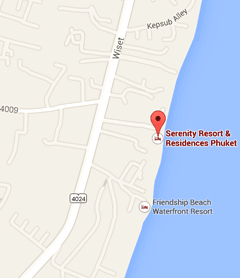 Let us know your thoughts at blog@serenityphuket.com.